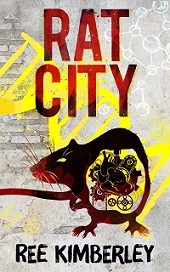 I’m excited to reveal the cover for my new young adult speculative fiction novel, Rat City. The cover artist is the fabulous Rachel Lawston. Rachel was great to work with. I didn’t have much of an idea about what I wanted the cover to look like but what I did know was that I wanted a “street-art” feel to the cover, and that a rat had to be front and centre. I’m really happy with the result. I think it’s eye-catching and will stand out from the crowd. Hope you like it, too! Rat City is available now on Amazon, Google Play, iBooks, Kobo and Barnes and Noble. That is one slick cover. Very eye-catching. Congrats on finalizing it! Thanks! Glad you like it. The designer Rachel Lawston did such a fantastic job.